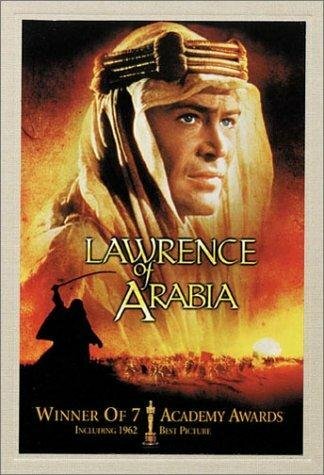 Everyone knows Lawrence of Arabia, it’s one of those films that’s just part of the furniture of cinema history. If it suddenly wasn’t there, magically stolen by some alien civilisation somehow, we’d notice it was gone. The slightly brighter piece of carpet below its spot in the corner of the dusty room where we’d kept it for the last 50 odd years would scream out to us that something was wrong. From my perspective this makes it a bit difficult to review. What am I adding to the world through this review? Basically nothing. I’ll give you my opinion which will be just about the same as the majority of other people who’ve seen it and the World carries on turning. I’d made the decision to review one of the greats from my list of Great War Films. I’d actually chosen ‘All Quiet on the Western Front’ (1930) for the review treatment but I wanted to get a new cleaned up copy to watch before typing up my thoughts. There’s a new Blu-ray version which has been restored and includes the little seen silent version as an extra. So I’m actually planning a triptych of the 1930 version, the 1930 silent version and my friends Colin and Wes from 100reasonstogooutside.blogspot.co.uk were going to review the 1979 Version as well. The problem is I live in a global backwater called New Zealand where the lack of people, commercial competition and the distance from anywhere else makes it an easy place for businesses to provide a low level of service and still charge well over the odds. Short of paying an exorbitant premium to get it imported I needed to wait while my local High Street retailer takes my money and lies to me on a weekly basis about the imminence of my orders arrival. And then Omar Sharif died and that gave me no choice but to review Lawrence of Arabia instead. So, do I need to do the usual run down of the basics? Probably not but I’ll do it anyway. Lawrence of Arabia, 1962, Peter O’Toole, Omar Sharif, Alec Guinness, story of the war years of T. E. Lawrence. It’s a true epic with the version I have coming in at 207 minutes although the original cinematic release was 227 minutes! This means that it’s the longest film to win the Best Picture Oscar being about a minute longer than ‘Gone with the Wind’. I can’t take responsibility for that stat, I’ve lifted it straight from the wiki page. Do I need to tell you how good it is? Again, probably not but I need to add some meat to this review so I’ll bang on for a while. It’s good. The landscape camerawork is amazing. The scale of the backdrops, the sheer size of everything on the screen and the miniscule dots of humanity lost against those backdrops puts our civilisation and cultures with their warring natures into perspective. There are multiple scenes where the production tries in vain to fill the vast spaces. Swathes of extras on horses and camels, hundreds of them, march off to war and still appear tiny against the humungousness of nature. Peter O’Toole plays T.E. Lawrence much as he was described by his peers, clumsy, uncomfortable in his own skin, effeminate. The only downside is that he’s apparently a good 6 inches taller than the real chap. But he plays the role well. He wasn’t at home on a camel (is anyone?) and it’s obvious as you watch the things canter and slowly increase pace to a gallop (or whatever the camel equivalent of a ‘Gallop’ is). The egotist side of the real Lawrence is overt but not harped on. It’s a slightly airbrushed portrayal of the man by all accounts, but then right at the start a journalist is canvassing attendees at his funeral for their thoughts on the man and it is there that we hear of the egotist and the showman. There’s plenty of Britishness on display. Plenty of pomp, class structure and rampant racism. Lots of calling the locals ‘Bloody Wogs’ and ‘Absolute Savages’. The Arabs are portrayed as bickering, blood thirsty idiots who can’t keep the water running. There’s the back-stabbing diplomat (played by the dude from Casablanca in what seems to be a near facsimile of his character from that earlier film) and there’s the moustachioed Army General replete with cane and fetish for wearing women’s underwear (probably). Other than being a Great War Film itself there are other Great War Film links. Omar Sharif was very good friends with Tom Courtenay who starred in ‘King and Country’ (1964), the brilliant and memorable soundtrack was written by Jean Michel Jarre’s dad. Jarre jr having had Oxygene on the soundtrack to Peter Weir’s ‘Gallipoli’. I’m pretty sure Peter Weir was purposefully referencing ‘Lawrence of Arabia’ in some of ‘Gallipoli’ as well, but then I suppose the location and the incredible scenery makes it impossible not to. Regarding the scenery, there was another link I spotted. Now, as I’ve said before I’ve had the misfortune of watching John Fords ‘The Searchers’ starring John Wayne. A highly regarded film, regarded highly by idiots in my view. I’m sure there’s a bit of Emperors’ New Clothes going on. It’s dreadful, I’ve said it before but I’ll say it again John Wayne is a terrible actor, the script makes no sense and there are massive plot holes. But what it does have is scenery. Loads of massive scenery and I get the feeling that there are references in Lawrence of Arabia to some of the scenes in ‘The Searchers’. So what do I think of it overall? I love it. I think it’s too long of course but then that’s because I have no attention span. But honestly, for the first two hours it’s gripping stuff, then it tails off a bit and the last 40 or so minutes drag on. God (Allah, Buddha, Morrissey) knows what the 227 minute version is like. But still, I love Lawrence of Arabia. It’s as British as casual racism, bad teeth, teenage mothers and celebrity idiots. It’s Coronation Street, Cadbury’s Minstrels and the BBC. Butterscotch Angel Delight, drinking 12 pints of Stella before 9pm and smacking the wife in the mouth. It’s journalists fawning over royal babies, it’s a middle order collapse, it’s the Last Night of the Proms and we’re all there in our plastic union jack bowler hats singing ‘Land of bloody Hope and Glory’. It’s a part of me, my DNA and heritage. I love it. Clicky Clicky to get your self a little bit of me for yourself.